Gelli Primary School is closed today TUESDAY 22nd DECEMBER due to the freezing conditions in the surrounding areas around the school. Despite the efforts of the caretaker to make the pathways around school accessible, the surrounding areas are treacherous and I have no alternative but to close the school due to health and safety. This information has been circulated to the BBC and news of the school closure is on the website. 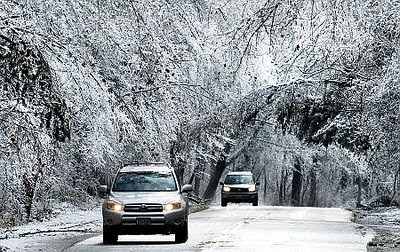 Please will you inform as many parents as possible to avoid any unnecessary travel. The Christmas activities photographs have been posted on the School Gallery. Most of the photographs were taken by Ethan Derrick from Year 6. Well done Ethan. We hope that this gives you an insight into the fun and laughter we had with the children these past weeks. Gelli Primary School is CLOSED for staff and pupils today on Monday 21st December. The pathways are very dangerous and despite the caretaker attempting to clear them I have no option but to cloe on health and safety grounds. I anticipate that the weather situation will improve as the day goes on and anticipate that school will be open tomorrow. Any school closure will be communicated to the BBC and Real Radio and we will attempt to inform parents by means of telephone calls, texts and parent updates. After the six wonderful concerts we have had in the last two days, my thanks go out to the staff and children for some memorable performances.Thank to you parents, grandparents and other members of your extended families for supporting us and giving the children so much encouragement and applause and generously donating over £250 in the collections. 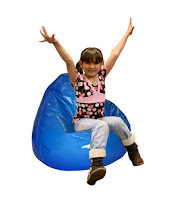 The staff have already decide to earmark the money towards purchasing the wet weather gear for the Foundation Phase children and some more Flip Video cameras for the Juniors to use to record their work. 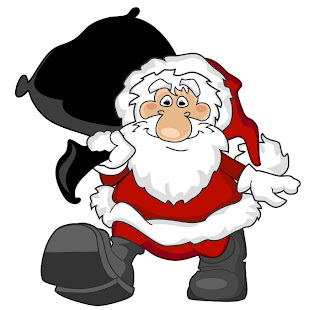 Tomorrow the Junior children will enjoy their Christmas party. 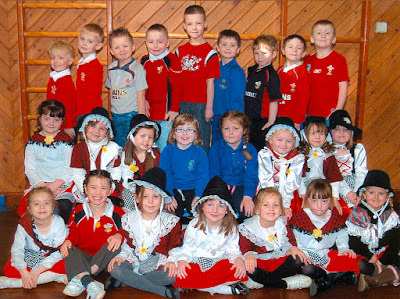 They can wear party clothes to school and all children are allowed to wear their normal clothes until the end of term. Mrs Edwards and the kitchen staff prepared a fantastic Christmas dinner for us today. The staff helped serve the food as there were so many pupils opted to have school dinner today. The children really enjoyed as you can see from this video. Diolch yn fawr Mrs Edwards. 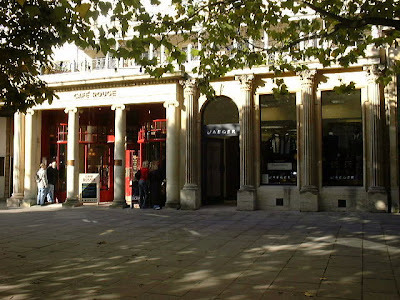 I would like to thank all those who supported the SHOPPING TRIP to Regency Cheltenham on Saturday, we all had a great time. As always a massive round of applause to Mrs Sims for organising the event so efficiently, as usual, and managing to have a quiet word with Derek the Weather Man to keep the rain in Wales. We raised a total of £70 from the quiz and raffle on the trip that will go towards school funds. Diolch yn fawr bawb. Our Christmas Concerts will take place on the following days. Tuesday 15th December 2009 at 1.30. p.m.
Wednesday 16th December 2009 at 9. 30 a.m.
Tuesday 15th December 2009 at 2.15. p.m.
Wednesday 16th December 2009 at 10. 15 a.m. There will be a short break between the two concerts for parents to come in and out of the hall. We do not charge an entry fee but a retiering collection will be taken for school funds. Wednesday 16th December 2009 at 6.00 p.m.
You will have received a letter with a ticket allocation form on which needs to be brought back to school by WEDNESDAY DECEMBER 9th. Tickets will be sent out via pupil post that evening. Should there be any additional tickets available we will inform you by pupil post then and any spare tickets will be distributed on a first come first served basis. There will be a limit on how many additionl tickets that will be vailable per family. Friday 27th November will be an INSET day for the staff at Gelli Primary and school will be closed for all pupils. Tomorrow is Children in Need Day and as usual we will be celebrating and raising money for children who are less fortunate than us. This year we will be dressing up "all spotty" either in pyjams or just anything that has spots on. 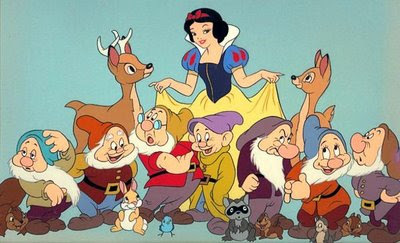 In fact you can dress up in anything at all as it is a non uniform day. 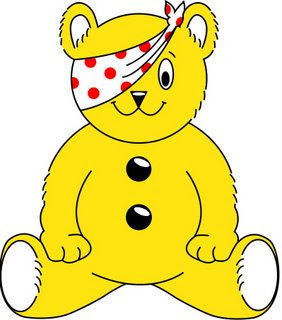 We will collect a donation and this year our students will be organising a class competition where each pupil will have the opportunity to chose an area on a BIG PUDSEY BEAR. The students will reveal winning area and the name revealed will will a Pudsey Bear. During the afternoon we will spend our Golden Time undertaking special Children in Need activities with the staff and students. Look out for our special Children in Need space on the School Gallery. Check out what we got up to in 2008. I have begun to post collections of photographs from activities undertken by the children and staff at Gelli Primary in a Photographic gallery. I have had some feedback from parents that this link requires a password and log in. Please will pupils and or parents try to access this area either via the link above and more importantly via the link on the school website site map. 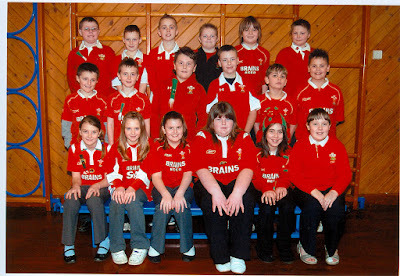 The latest additions are photographs of the Gelli Primary School Choir Remembrance Concert and the Wales v Samoa game. If you have problems accessing this site please report any problems to me by e-mail at head.gellipri@rctednet.net or by telephone. Congratulations to the PTA committee for organising this year's Summer fete which took place in the school grounds last weekend. The whole village came out to support us and the total amount of money taken on the day was in excess of £1500. Once the expenses had been deducted we raised just over £1100 for the PTA funds. 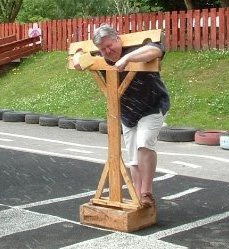 Mr Hughes, the Young Mr. Jones and I took turns to go into the stocks and several pupils took their revenge on us. As it was such a super day weather wise, it was advantageous to be wet on such a hot day. 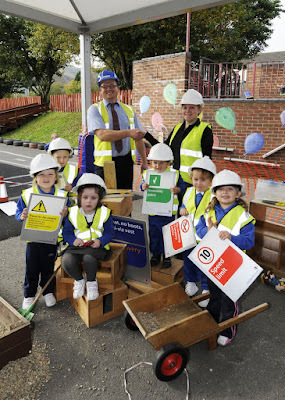 This year the PTA has donated a Smart Board for Year 3 and a superb shed for the Foundation Phase equipment. Thank you to Mrs Sims and the other parents who work so hard in arranging such a great day. If you want to be involved in helping the PTA visit the PTA page on the school website for details. I have recently added a link to a school calendar which will contain up to date details of school activities. 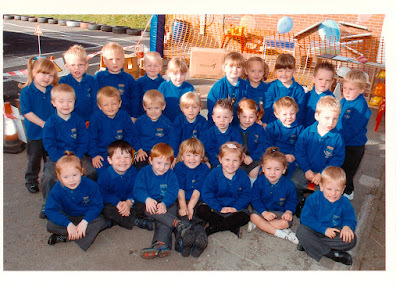 Click on http://www.gelliprimaryschool.org.uk/calendar.htm to reach this facility. We will add all dates and times of trips and other information when available. Mrs . Catherine Davies, our Reception Teacher and Foundation Phase Leader has been appointed to a similar post at St David's Church in Wales Primary School, Colwinston in the Vale of Glamorgan. 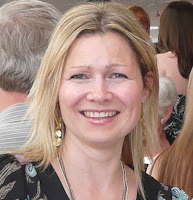 Mrs Davies takes up her appointment in September after being with us at Gelli Primary for over twelve years. Mrs. Davies has been instrumental in managing the preparations for the implementation of the Foundation phase. She and the remainder of the Early Years and Key Stage One staff have worked tirelessly to give our children the best possible start to their education. Mrs Davies will leave us at the end of the term and she goes with our best wishes and we hope that she has every success in her new school. Major technical problems have prevented us from updating this site since the beginning of term. But I'm glad to say that we're back. Please look on the Governing Body pages for electronic copies of the Summary and Full Annual Report to Parents. There is also a letter confirming the details of the meeting on Monday 6th July. 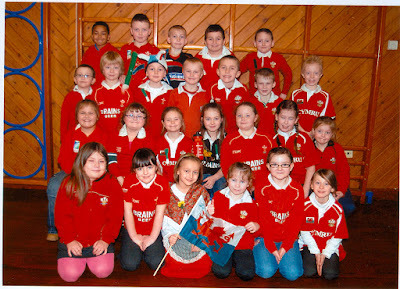 We have received the missing photograph that failed to appear in the Rhondda Leader St David's Day edition featuring Class 3. Last Friday we received a certificate in the post to inform us that we had been successful in achieving our ECO-SCHOOLS BRONZE AWARD. 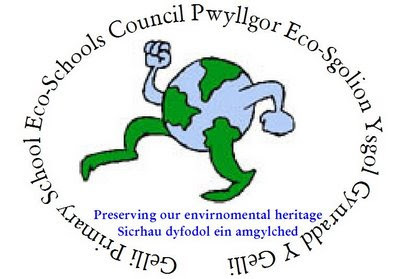 Mr Jones and the Eco-Schools Committe have built upon some of the work established as part of our Healthy Schools activities and Focus week activities to gain this acreditation. Llongyfarchiadau bawb. We will now set our target on achieveing our SILVER AWARD soon. More news of this award can be posted on the Eco-Schools Blog Pages. Our latest newsletters have been published on the newsletter page on the school website. Items include details of School photographs, Red Nose Day, Dinner Money, news of the Easter Bonnet Parade and details of end of term and vacation information. Our Eco-Schools councillors have been busy preparing the evidence for our application for the Bronze Award. They have designed their own logo which will appear on all their stationary and promotional material. Friday the 13th is normally an unlucky day, but at Gelli Primary School all the staff and children "Did something funny for money"
Most of the children and staff turned up in their pyjamas and in the process raised £214.40 for Comic Relief. Year 6 decided that they wanted to do a sponsored car clean, so supervised by Mrs. Date and Mr. Evans they got the vacuum cleaners, glass spary and dusters out and got rid of all the grit, stones, stale pasties and crumbs from the inside of their cars. They paid £3 for the privilige, and by the state of some of the cars they should have paid much more. Gelli Primary children have a partner school in Mbale, Africa and in July participated in a sponsored walk with Kath and Phil Rickards from the Pont Partnership to raise money for our partner school. 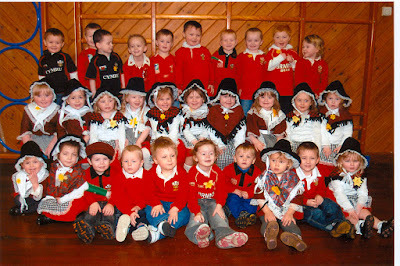 I received a telephone call from the editor of the Rhondda Leader last Friday apologising for the oversight in publishing the duplicate photograph of the Reception class in this week's edition and omiting the photograph of Class 3 (Mrs Fraser's class). The photographer will return to retake the picture on Monday. 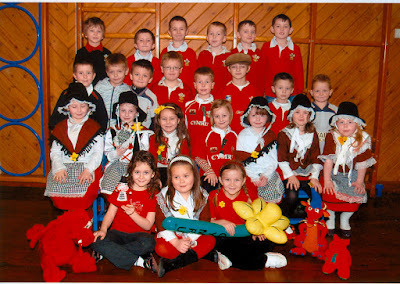 A letter has been distributed to class 3 children via pupil post informing children to wear their Welsh costume. I am asured that the photograph will be in next week's edition and details of how to purchase prints will be placed on this blog when we receive them. This year's Treorchy Male Choir and Coke Cola Junior Musician of the Year Semi Finals were held last night in the Arts Theatre at Coleg Morgannwg, Llwynypia. Our school's representatives were our instrumentalist Katie from Year 5 who played the Cornet and our singer Giorgia from Year 4. 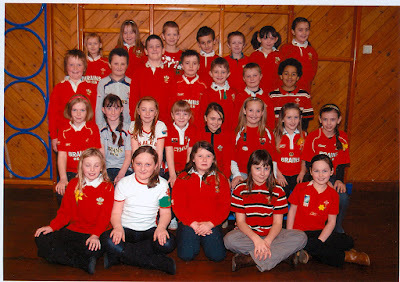 They competed against other singers and instrumentalists from Ton Pentre Juniors, Penyenglyn Community Primary, Penpych Community Primary, Parc Primary, Treorchy Primary, Ysgol Gynradd Gymraeg Ynyswen, Williamstown Primary and Bodringallt Primary Schools for a place in the final which will be held in Treorchy Comprehensive School on Wednesday 25th March. Their performances were adjudicated by Welsh National Opera Company Mezzo Soprano Kate Wolveridge and the choir's musical director Janice Ball. Unfortunately the girls were not successful in reching the final, but both girls sang and played wonderfully and we are very proud of them. You can see their performances on our Performing arts blog by clicking on these links. 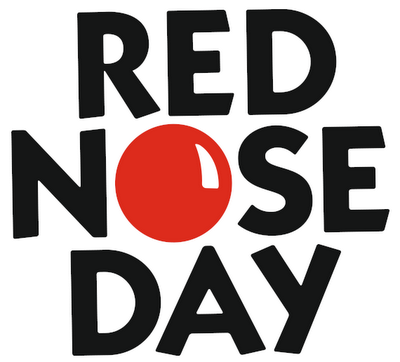 Friday March 13th is Red Nose Day. 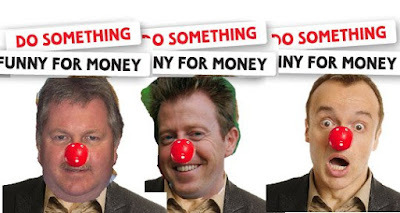 This year’s theme is “Do something funny and raise some money”. We will ask the children to make a small contribution towards the appeal. School uniform is NOT required that day and we will encourage all pupils to participate fully in keeping with the spirit of the day. The school council have suggested that all children should come to school in "pyjamas" if they wish. Unfortunately we have suffered a photocopier malfunction which will not be repaired until early next week. 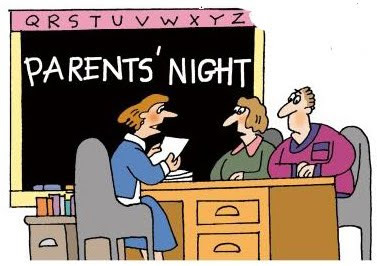 I have been able to distribute a newsletter informing parents of the INSET days next week but all future communication will be made by electronic mail until the machine can be fixed. Please will parents who use the internet service assist us by "spreading the word" and keeping those parents who do not have internet access informed. 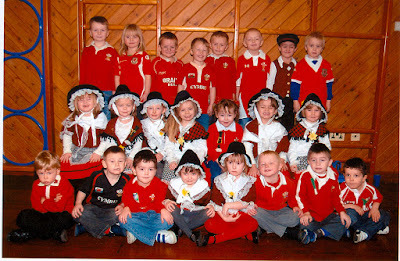 Please find enclosed as promised this years, St David's Day Pictures. Once again prices are a highly competitive, £6.00 for an 8x6, colour photograph, presented in an attractive folder. The school can once again retain 10% of all money raised at the school, as a good will gesture to the school. In your letter home to parents, could you please inform the parents the pictures are on sale, as a large number of people contact us each year, wondering where they can purchase pictures. Please send your order along with a cheque, made payable to M GUNTON, to the above address. 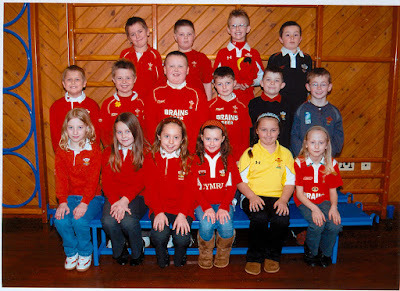 If you have any questions regarding your St David's pictures, please contact M Gunton on 01443 733277. Once again could I take this opportunity of thanking the school for their continued support. Ystrad Communities First are providing Half term activities focusing on fitness. Your child will receive a flyer delivered by pupil post to publicise these sessions. The Met Office has issued a severe weather warning for snow arriving in our area overnight and in the early hours of Friday 6th February 2009. 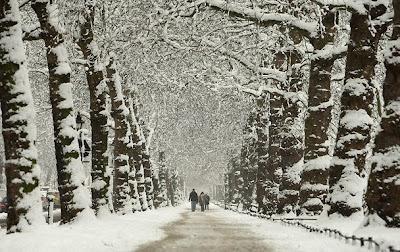 There is a chance that between 1cm - 2cm will fall generally and between 2cm - 5cm on higher ground. It is forecast to clear by mid morning. 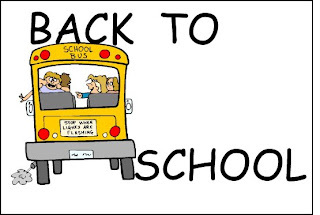 Rhondda Cynon Taff County Borough Council have issued further advice regarding home to school transport which has been withdrawn due to the possible disruption to traffic on Friday morning. This does not effect children at Gelli Primary School. There is expected disruption on roads and a decision to close the school will be taken as early as possible when we know what conditions are like in the morning. The protocol that we need to follow is posted on an emergency arrangements page. We will endeavour to contact parents via postings on the school website and bullitins in the media. Thank you for your patience during this unsettling time. IT IS OUR INTENTION TO OPEN THE SCHOOL UNLESS HEALTH AND SAFETY CONCERNS PREVENT US FROM DOING SO. Miss Matthias has contacted both the Park and Dare theatre and Ralph Cole and arrangements for the pantomime visit will go ahead as planned tomorrow unless that the weather intervenes. Any outstanding balances can be paid to Mrs. Thomas tomorrow. Lunch will be provided by the Canteen staff once the children are due to return from the performance at 1230 for nursery and reception and 1245 for infants and juniors. 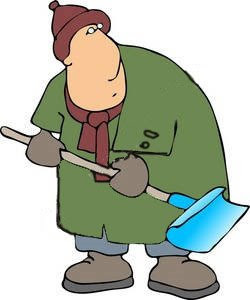 Arrangements for the possible school closure in the event of the forecast heavy overnight snowhave been posted on the home page of the school website. RCTCBC has issued a severe weather warning of heavy snow which will hit our area around 11.00 p.m. on Wednesday evening and persisting until mid morning on Thursday. There is expected disruption on roads and a decision to close the school will be taken as early as possible when we know what conditions are like in the morning. The protocol that we need to follow is posted on an emergency arrangements page. We will endeavour to contact parents via postings on the school website and bullitins in the media. Thank you for your patience during this unsettling time. Arrangements for Friday 6th February will be posted tomorrow. There is advanced warning of further snow which will possibly lead to arrangements for the remainder of the week being amended. 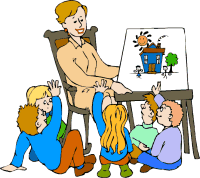 THURSDAY 5th February is due to be a school closure day where the staff will be involved in staff training. If the provider is unable to undertake training due to the weather conditions school will likely to be closed and the training postponed to an alternative date. As for the arrangements for the Pantomime scheduled for Friday, I will contact the Park and Dare and Ralph Cole, our transport provider, tomorrow to see what contingency plans will be in operation. 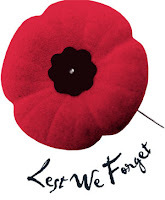 Arrangements will be posted on the school website as soon as we know precise details. Please check back often and if possible share information with other parents and children. thank you for your patience. I have just received a copy of this e-mail which was sent to all schools this afternoon. Consequently there will be NO SCHOOL AT GELLI PRIMARY ON WEDNESDAY 4th FEBRUARY 2009. Due to the current weather conditions the decision has been taken by the Council's LEA and Environmental Services Directorate to close all of the schools in County Borough of Rhondda Cynon Taff, tomorrow Wednesday 4th February 2009, therefore no schools transport will be provided in the County Borough. The Council will continue to review the situation relating to the weather and associated transport arrangements and will keep you updated accordingly. Continue to check both the Rhondda Cynon Taff and BBC Wales websites for updated information. Rhondda Cynon Taff County Borough Council have issued the following severe weather update and a snow warning update from their website on Tuesday February 3rd. The school yard, pathways and the streets surrounding the school have several centimeters of snow lying on them at present and although there is a partial thaw happening at the moment it is also expected to freeze overnight. 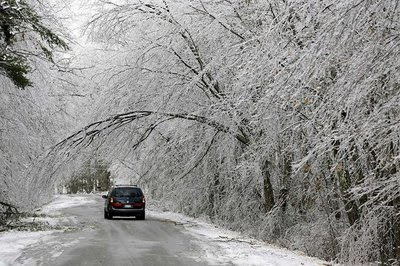 There is already a warning from the Met Office of adverse driving conditions in the morning. The Caretaker will make a risk assessment at 6.30 a.m. and I will post the latest news on the school website. School closures will be communicated to everyone on Good Morning Wales and Real Radio. More details on the arrangements for the remainder of the week will be posted here and on the front page of the school website. Thank you for your patience. 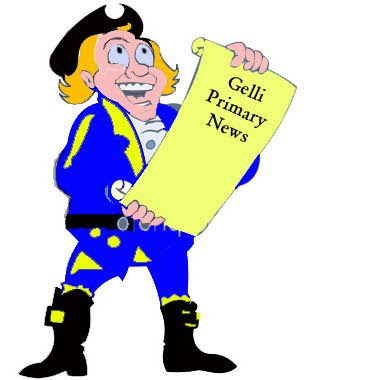 Gelli Primary School will again be closed today. After heavy overnight snow it is unsafe for the children to move in and around the village. 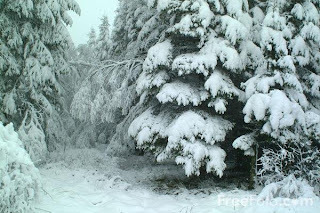 Notices have been posted on the Radio Wales snowline. Please inform any parents who you know and advise them to follow the details on the school website. Today, I was forced to close the school due to health and safety concerns. It was not a decision that was taken lightly and I apologise to parents who were forced to make alternative child care arrangements at very short notice. My decision was influenced by the amount of snow lying in the school playground and on the surrounding areas. This made walking around the school paths and surrounding streets very treacherous. The caretaker has made every effort to clear the paths but there is compacted snow which has turned to ice and the rock salt is taking time to be effective. There is also a likelihood of more snow later this afternoon and the possibility of having to contact all 207 parents to collect the children would have been difficult. The Comprehensive school took an early decision to close as did a number of our neighbouring schools. I will post details of further disruption to school on this site when available. Thank you for your patience.